Leading Independent Operator, Dine Contract Catering, has celebrated its commitment to staff development by holding its first ever Awards Day. 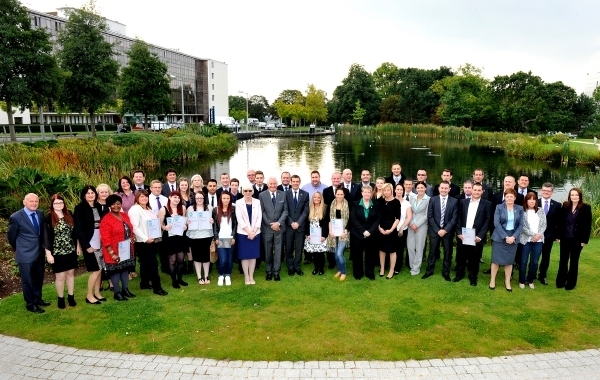 The event, which was hosted at the company’s Head Office in Birchwood Park, Warrington, saw a total of 50 awards handed out to team members from across the business. Dine Contract Catering invests heavily in training, personal development and educational programmes to ensure that all 950 strong workforce is given both the support and opportunity to grow with the business. On top of regular monthly training, over 30% of its employees are currently working towards an NVQ qualification alongside personal career development paths. The Awards are an opportunity to recognise and reward team members who have shown particularly strong development, with categories ranging from Certificates in Customer Service to Diplomas in Food Production and Cooking Skills. “This is a proud day for Dine Contract Catering – not only for us as a management team, but also for all our team members who have worked so hard to achieve their awards. Each individual has an important role to play in our success, which is why in order to innovate, improve and grow our business we invest in the people who can make that happen.” Also receiving awards on the day were intakes from the company’s Apprentice Programme. The company takes on up to 10 new apprentices every year, who also complete the Duke of Edinburgh Bronze Award. “We have a passion to help the youth of today, which is also why we have also chosen to sponsor the Duke of Edinburgh’s Award Scheme,” added Ian. Kevin Yates, General Manager at one of the companies prestigious sites in Leicester, received commendation for achieving two awards including a NVQ Diploma in Management. To round off the celebrations, the team enjoyed a barbecue on the lawn, complete with a cake cutting ceremony.